Minky fabric is so baby soft that making a baby blanket seems like a natural project choice. Stitch this simple blanket for your baby or as a baby shower gift the recipient will love. Since you won't be able to stop at just one, download the instructional pattern to add to your sewing library for future use. For additional help in printing the instructions, go to Guide to Adobe Printables. This basic blanket pattern can easily be altered with your own special touches. The following are a few ideas to spark your imagination. Use the backing fabric as the blanket binding. Cut the width and length of your minky fabric 4" smaller than your backing fabric. With the minky and backing together with wrong sides facing, center the minky on the backing. Fold the backing edges over 1", then over 1" more to overlap the minky edges. Pin, pin, pin. Topstitch the folded edge to bind. Instead of one fabric as the backing fabric, sew a square-patched backing using assorted complementary fabrics. For a more feminine finish, attach a ruffle trim. Insert the trim between the layered edges and facing inward. Pin the edges. Sew seam and topstitch as the pattern instructs. Don't let the thought of sewing minky fabric intimidate you. These tips will give you confidence in your sewing abilities. Minky fabric does not shrink; however, always pre-wash other fabrics that you will be using with the minky. To minimize issues with the edges shifting or stretching, leave extra minky around the edges of your pinned layers. Trim excess after stitching. Use lots and lots of straight pins to prevent shifting and stretching. Pin 1" to 1 1/2" apart. Use a new standard or stretch sewing machine needle. Typically a 1/4" seam allowance is sufficient for basic projects but when sewing minky fabric, a 1/2" seam allowance is recommended. When sewing minky fabric with another fabric, sew with the minky fabric on the bottom. Cutting and sewing minky fabric can cause a messy dust cloud of fluff from the cut edges. Clean and vacuum your sewing machine after use. 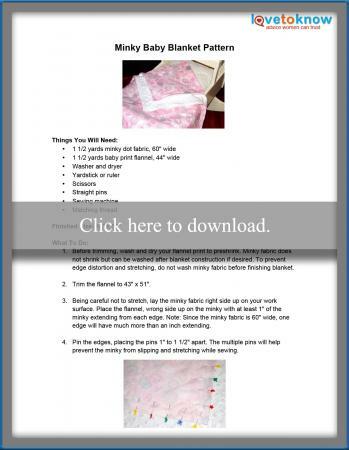 Since minky is a bit pricier than average fabrics, you don't want to let any of the scraps go to waste. Cut 8" to 10" squares from your leftovers and make baby washcloths using the same instructions as for the baby blanket pattern.